We were invited to attend Apple Day at Borough Market in London this year. It is an annual event that takes place in the market at the end of October and celebrates the nations favourite fruit. It also coincides with the October Plenty harvest festival. Traditionally the stalls have mainly focused on the apples themselves and other fresh produce, but we were invited to take a pitch and show off some of our trees and other plants. We don't actually get much of an opportunity to get off the nursery and since we sell all of our fruit trees and fruit plants online we hardly ever get to meet our customers face to face. We jumped at the chance and duly turned up at the market at 8am (on a Sunday!) and were faced with the immediate problem of how to get a 12 tonne lorry through the narrow streets at the market, and find a parking space! Borough Market is actually next door to Southwark Cathedral who help celebrate Apple Day, beginning with their 11am Eucharist and other activities throughout the day. The Lions Part Theatre Company were also on hand to help celebrate the October Plenty harvest, leading a procession from Shakespeare's Globe Theatre and finishing up in the market itself. 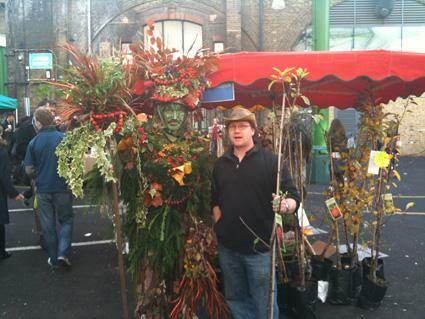 By far the most interest was drawn by The Berry Man (the autumn incarnation of the Green Man) who carries an apple tree to be planted somewhere in the Bankside area. In the picture you can see what happened when the Berry Man met the Nurseryman along with his own apple tree. I think our tree was bought to be planted somewhere in NW6 though! We weren't the only people taking pictures with the Berry Man on the day, although I am fairly sure that we were the only people to be able to identify all his autumn foliage! It was a really great day, and a genuine pleasure for us to get out and meet some of our customers, and maybe introduce ourselves to some new ones. 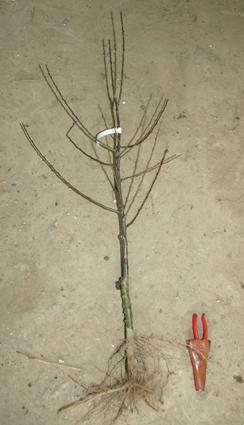 I think that the most surprising thing of the whole day was the amount of people who were prepared to carry their apple trees home on the Tube! Although I have worked in commercial horticulture for over 15 years I haven't always had a garden, or been able to grow plants for my self. With the housing market the way it is we have been living for the last year or so in a rented house with a small garden. This presents a couple of challenges. Firstly we aren't really allowed to plant anything, and secondly it is a small garden that also need to double up as a play area for our son. I have always tried to grow a bit of fruit and veg and a few herbs and have had a bit of success, along with quite a few failures. I am now forced to grow everything in containers of one sort or another, so I am quickly becoming and expert on what works and what doesn't. 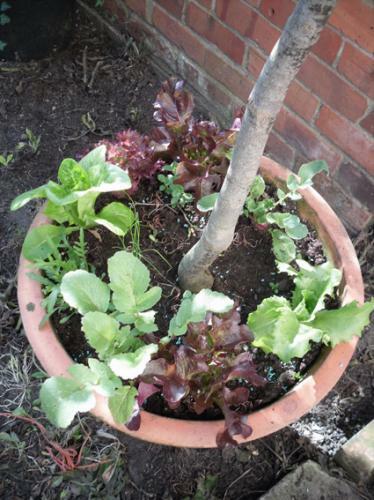 I think with more of us wanting to grow our own fruit and veg and with the waiting lists for allotments growing longer, those of us with small gardens need to get a bit more creative to make the best use of space. 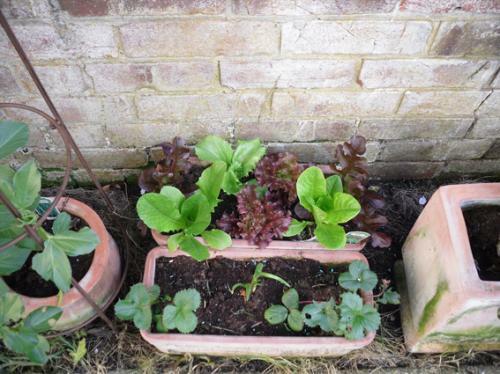 I think my greatest success this year has been the salad plants like lettuce and rocket. I was running out of space so I under planted a Japanese Maple that I have owned for a few years with whatever I could fit in to see what would happen. With careful watering everything flourished and did really well. The added bonus was that my son (4) really loved helping and thought that this was his vegetable patch, therefore he was much more likely to eat the salad leaves that came out of it! All in all a great success. There is one drawback I found with pot sharing. The Japanese Maple has always had an ants nest in the pot. Not a problem in it's self and we have always got on well, but the ants farm a colony of aphids that spend the summer on the tree, this meant that the salad plants did get pretty heavily attacked. as I don't spray chemicals I had to rely on a high pressure jet from my pump up plant sprayer. It worked well, and gives a tremendous sense of satisfaction to see clean leaves. The ants weren't too happy though!